E-CATALOG of Equipment operating instructions E-Manual of semi automatic tubes labeling machine to save the trees and lives! 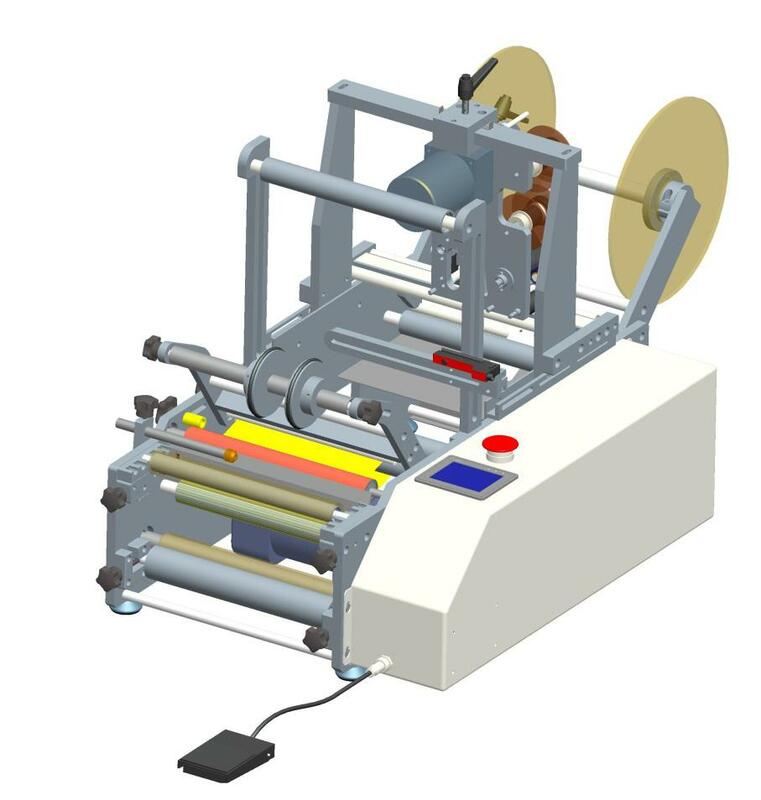 1 , This labeling machine for the single stickers and double-sticker labels feature, you can manually switch. Specific reference to operations sections. 2 , Labeling machine belonging to the non-standard equipment, its operation requires a certain amount of technical skill. Operation level, affects the efficient use of equipment. 3 , Need to follow the instructions in the manual to operate the equipment, or carried out under the guidance of our technicians. 4 , The technical manual is dedicated to the EP211 semi-automatic round bottle labeling machine (hereinafter referred to as labeler). Its purpose is to ensure that the professional use and adjustment of the equipment. 1 , Body parts, electric components, as well as changes to software upgrades, also including parts of specifications and used the brand, to maintain the product's advanced technology, but is not committed to deliver products free of change. 2 , We have permission to device integrity protection, lack of factory technician under the direction of, not without permission to modify devices of mechanical or electrical parts, such as damage caused by violation of this provision by modifying party. 3 , On the basis of this equipment, increase in ink-jet or other feature, we provide technical guidance on configuring, but don't need to be responsible for supporting equipment. 4 , Manual for this device and the operation of our company have intellectual property rights, such as copying, should bear the legal responsibility. 1 , Danger! Used to see to it that the ground to prevent electric shock. 2 , Danger! Make sure the voltage is not overloaded. 3 , Be alert! Electric box section, below the lines which need electrician to guide operational. 4 , Be alert! Rotating parts requiring special attention to prevent pressure injury. · Ensure that only trained and those who have permission to operate, layout and maintenance of the equipment. · Only allows qualified people, professionals, engineers and equipment to complete the layout. The labeler is within standard products, and have technical requirements for operators, you need to have a break-in period for a week or so. Run-in period, operation of equipment, technical parameters are reached, need to industry in a timely manner to reflect, to obtain technical support. Issues are essentially in the adjustment process can obtain information from this manual. Cylindrical objects can be used for a variety of thoughtful, such as xylitol, cosmetic bottles, etc, with a full week / Half week labeling, circular label on the back features; it can be equipped with semiautomatic ribbons fight code machine, printing machine, label print production lot number information. * Application examples: oral round bottle labeling, Xilin bottle labeling, labelling of xylitol, shampoo bottle labeling, small taper cosmetic labeling. 1、 Tray: is used to label a volume. 3 , Mark electric eye frame: used to install mark electric eyes, magic eye enables, and move around. 4 , Capping institutions: for pressure bottles, marked effects of his guarantee, can be adjusted through the labeling machine knob on the left side of the tightness. 5 , Stripper plate: used for peeling labels, General debugging well before delivery, special situations can also be adjusted. 6 , Positioning device: uses the left top to ensure the location of the label on the bottle, can be adjusted left and right, up and down. 7 , Support rod: can be placed in a different place, adapts to different specification the bottle label. 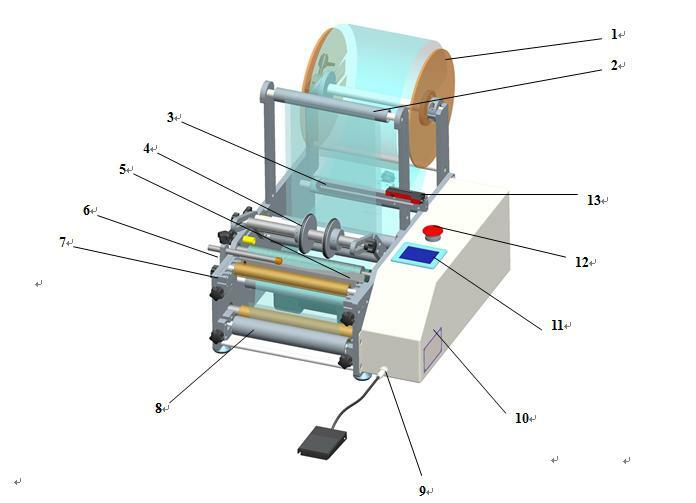 8 , Traction body: by pulling the bottom paper, Peel labels, its tightness can be adjusted by screws. 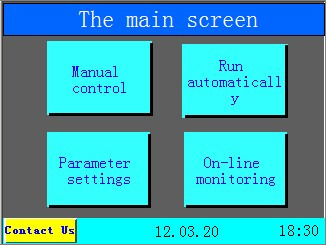 11 And the man-machine interface: can be used to debug device actions, parameters! 1， Follow directions above bypass label through traction body, disengaging the drive system locks the first five-star put his hand through the lock after the label. 2 , The label when traction, note tags cannot be skewed, and then hold down the jogging in a manual State 1 Switch label automatically. 3 , After completing the two steps above, slightly pressing labels "clamping shrapnel" (top 1 ), Remains marked with tension. a. Labels through the electric eye to note that required through the slot sensor position, and try not to rely on the magic eye on both sides. 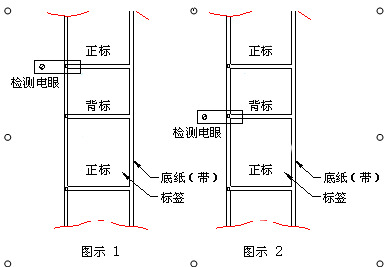 Depending on installation as shown in the figure. b. When the end of label paper after traction body, required an external "five star handles" matter. 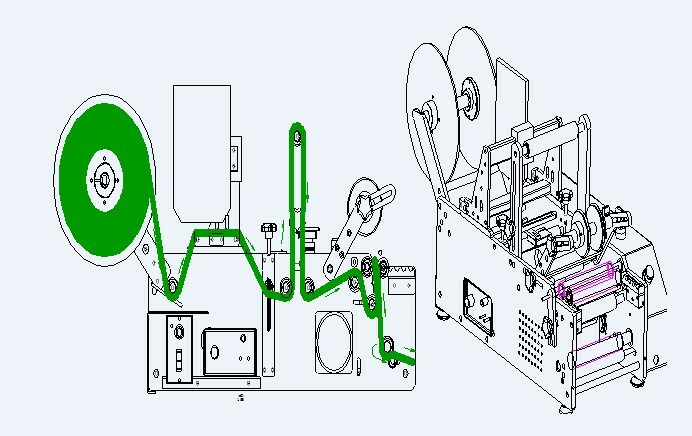 c. Shrapnel under the drop feed mechanism should be pressed to ensure label tensed State during the campaign process, correctly identified in favour of magic eye on the label. Labeling machine is to PLC As the core, receives letter from the start, mark two signals, output signals for electromagnetic clutch and motor movement. 2.1 Foot switch closed, motor rotation, driving his marked roll axis, indirectly drives the workpiece rotation. Electromagnetic clutch release, traction shaft stationary. 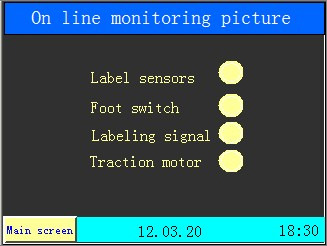 2.2 After the workpiece rotation, PLC Start the "delay labeling" program. While continuing to rotate the workpiece, clutch closed, traction body rotation, stripping tags. 2.3.1 In a single State, mark label electric eye detected signals, signal feedback to PLC, clutch release, motor rotational delay stop completed a labeling process. 2.3.2 Twin State, mark electric eye detects the first ticket signals, signal feedback PLC , Clutch release, motor continues to turn, in accordance with point 2 Set delay, closing clutch, split second label, mark electric eye detects the second label signal, motor delay stop, complete a labeling process. 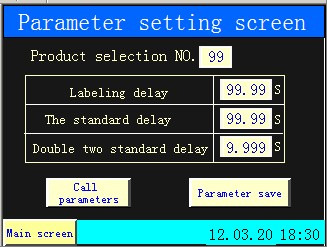 Called with a parameter: select the product number you have saved, can be called directly after the press labeling products saved parameters! First of all labels through the magic eye like the following diagram: If you pull the labels, yellow lights in a gap between labels and label are lit, there's label is off, you can not reset, you can directly use. When the yellow light is solid or is often borne out by the case, you need to reset the electric eye. Set as follows: first, the labels shown through the magic eye of the u -shaped trough, there are labels placed electric eye inside the slot, press and hold adjust button for 3 seconds, you can see the electric eye flashing yellow lights, Then release the button, where there is no label (only label the end of paper) placed in the magic eye slot, press and hold adjust button for 8 seconds, and then release the button at this point, Setup is complete . Label electric eyes pull in a tank, you can see that there are labels yellow lights off, gap offices in label with the label, the yellow lights are lit. 1） When " ready "When the lights, electric eye focus label in the Middle, pull the tags back and forth, such as changes to the output signal, electric eye is in working condition, can be used directly. 2） Short press the auto Setup button, green and yellow lights, electric eye catching medium signal, non-removable labels at this time, up until the green light quickly flashes. 3） When the green light flashing when media into second to magic eye focus location. 4） Short press " AUTO SET”. The green light is off. Electric eye catching the second type of media signals, non-removable labels at this time until the green light stays on. 5） Move the labels, in two local media decomposition, the output signal is lit, magic eye set. 6） “ READY” Solid, magic eye to use an object you can switch two media. �~ "PUSH" button down to confirm, left-right toggle to fine tune function. 1.4.1 On the premise of no product on the workstation, open electric eye amplifier with transparent cover, press "mode/cancel" key, transferred to "teach" document, digital box displays a value, this value will be an empty signal, in the following figure "67", numerical stability, according to "PUSH" to confirm. 1.4.2 Then place the product on the labeling station, close the left position, observing locations, by adjusting the position bar location to reach the position of the label on the product. 1.4.4 Transferred to the "ADJ" document, displays the numerical display box = blank signal +(heartbeat - blank signal)/2, the system default values for threshold, the signal value is greater than the critical value, it defaults to the object, is less than the critical value, the default is no object. Feedback signal to PLC, issue the appropriate directives. Thresholds can be adjusted through left-right toggle "PUSH" the left and right keys, increase or decrease in value, change the threshold. (Typically does not require adjusting) then press the "PUSH" to confirm. 1.4.6 Close the transparent cover, set an end. 1.4.7 When the product is placed when the labeling station, electric eye on measuring signal is detected, feedback to the PLC,PLC issued a directive, labeling machine began its work-related parts. Refer to the packing list, labeler is installed as indicated. Machine packaging packing slip-free, can be used directly. 2.1 Release the seven words on the tray handles remove tray, volume label, then tray lock (be careful not to clamp too tightly, to hand to drag the label is preferred). Follow drawn around the plotting and the labels right on bypass machine. In point State, observe the electric eye changes, label with the label gap time, jealous led lit (output signal). If the status of the electric eye is not normal, please refer to the electric eye adjustment section, adjust the electric eye. 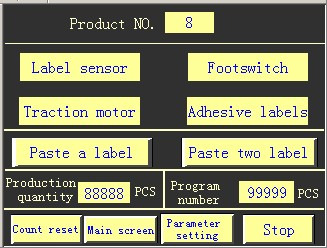 Automatically run State, step on foot switch once, observe the position of the label in the Peel Board. 2. adjust the length mark appropriate cases, and then by moving the electric eye position, move the electric eye testing slot to gap labels and label. Then, switch to automatic status, step on foot switch, automatically stop and then watch out location of length is appropriate, make the appropriate adjustments. 2.1 You can move up and down the length of the standard electric eye ways to reach, move up, early detection labels, label stripping length shorter. Moving down, delaying testing label, label stripping length longer. 2.2 Twin standard adjustments, paying special attention to magic eye location, if you are out of the Peel Board is marked, then corresponds to the electric eye that you want to test is marked on the . The following diagram 1 If out of the Peel Board is back labels, electric eye position shown 2 , And then click move 2 To adjust the distance between two labels. After following the steps above a good tune labeling machine, can be carried out properly labeling. Labeling is complete, power off in a timely manner, long periods of inactivity, unplug the power socket. 1.1 Label once completed, switch to the manual, please make sure the power is connected, Governor is open, and then press the "jog" switch, so traction pulling paper about the end of 0.5 Meters, aims at keeping the paper free to correct at the end of. 1.2 . 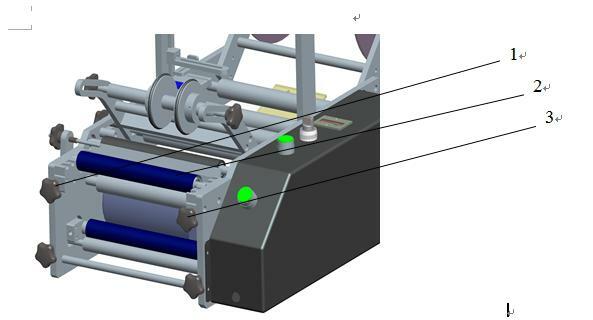 When the end of the paper automatically corrected, we will all adjust rollers on the limit circle, move the limit circle on both sides of the paper. When you replace the label at a later date, label is placed directly inside the limit. When replacing the different width of label, generally move only limit on the right ring, as a base-level on the other side, General recommends that you do not move. 1 , Insurance replacement, this device is on AC power, and to use fuse to prevent overload. 2 , Every time after use, are required to dispose of the junk, to ensure that the normal use of the future. l Do not use acidic solvent. Clean up waste paper scraps and debris. 1 , Pressure tape devices might not be tightly, resulting in marked with loose, electric eye test inaccurate. Pressing labels address. 3 , Posted mixed objects vary in shape or position to. Control of product quality. 1 , Pressure belt devices too tight, causing marked away , Pressure reduction. 2 , An automatic operation is marked with without deviation, rectifies a again. 1 His incomplete, can reduce the speed of labeling. 2 May be transparent labels, or labels too soft. 3 , Standard gravity of his improper adjustments, his important adjustment efforts. 4. in the beginning of the label folds, too soft may be the label, the label out of the bends at the time, lift the Strip panels as close as possible to the location of the product. product labeling towards another direction in the process of moving, slightly lift the support Rod bearing block on the left . 1 , Confirm that the power lines, no problem. 2 ， Label paper at the end of poor quality, or teeth too deep. This conformity label needs to be replaced. 3 Send speed too fast, slow. 1 , Mostly test electric eye did not set well , resetting the electric eye can fix. 2 , Electric eye does not apply the test labels, need to replace electric eyes can be applied. 3 , Electric eye damage, need to replace the electric eye. An Automation customer-oriented principle, to provide customers with satisfactory pre-sale and after-sale service. 1. provide professional technical advice before the sale, instruct customer selection. 2. provide labeling machine for training in the use of services, instruct the customer to the correct use and maintenance of labeling machine. 3. the provision of technical support services, labeling foil for steering customers to solve problems. 4. equipment warranty for one year, providing maintenance services. Thank you for using, if not satisfied with the equipment, such as quality, performance, service, welcome all of your suggestions!